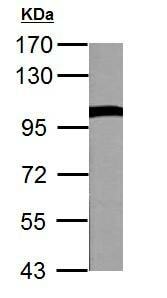 Recombinant fragment, corresponding to a region within amino acids 540-806 of Human VCP. A431, H1299, mouse brain and rat brain lysates; HeLa cells; Human breast carcinoma tissue. Our Abpromise guarantee covers the use of ab155146 in the following tested applications. WB 1/1000 - 1/10000. Predicted molecular weight: 89 kDa. Necessary for the fragmentation of Golgi stacks during mitosis and for their reassembly after mitosis. Involved in the formation of the transitional endoplasmic reticulum (tER). The transfer of membranes from the endoplasmic reticulum to the Golgi apparatus occurs via 50-70 nm transition vesicles which derive from part-rough, part-smooth transitional elements of the endoplasmic reticulum (tER). Vesicle budding from the tER is an ATP-dependent process. The ternary complex containing UFD1L, VCP and NPLOC4 binds ubiquitinated proteins and is necessary for the export of misfolded proteins from the ER to the cytoplasm, where they are degraded by the proteasome. The NPLOC4-UFD1L-VCP complex regulates spindle disassembly at the end of mitosis and is necessary for the formation of a closed nuclear envelope (By similarity). Regulates E3 ubiquitin-protein ligase activity of RNF19A. Defects in VCP are the cause of inclusion body myopathy with early-onset Paget disease and frontotemporal dementia (IBMPFD) [MIM:167320]; also known as muscular dystrophy, limb-girdle, with Paget disease of bone or pagetoid amyotrophic lateral sclerosis or pagetoid neuroskeletal syndrome or lower motor neuron degeneration with Paget-like bone disease. IBMPFD features adult-onset proximal and distal muscle weakness (clinically resembling limb girdle muscular dystrophy), early-onset Paget disease of bone in most cases and premature frontotemporal dementia. Belongs to the AAA ATPase family. Phosphorylated by tyrosine kinases in response to T-cell antigen receptor activation (By similarity). 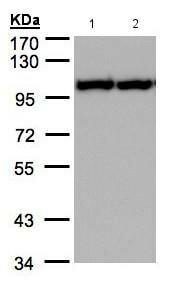 Phosphorylated upon DNA damage, probably by ATM or ATR. Cytoplasm > cytosol. Nucleus. Present in the neuronal hyaline inclusion bodies specifically found in motor neurons from amyotrophic lateral sclerosis patients. Present in the Lewy bodies specifically found in neurons from Parkinson disease patients. 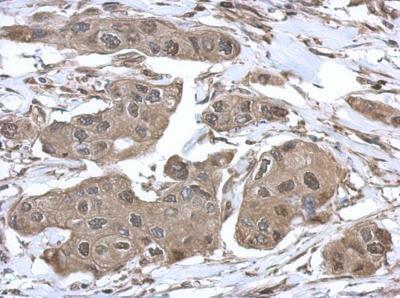 Immunohistochemical analysis of paraffin-embedded Human breast carcinoma tissue labeling VCP with ab155146 at 1/500 dilution. Immunofluorescent analysis of methanol-fixed HeLa cells labeling VCP with ab155146 at 1/500 dilution. 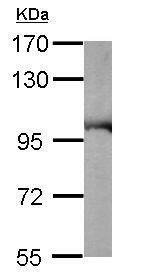 Right panel co-stained with Hoechst 33342.
ab155146 has not yet been referenced specifically in any publications. Publishing research using ab155146? Please let us know so that we can cite the reference in this datasheet. There are currently no Customer reviews or Questions for ab155146.